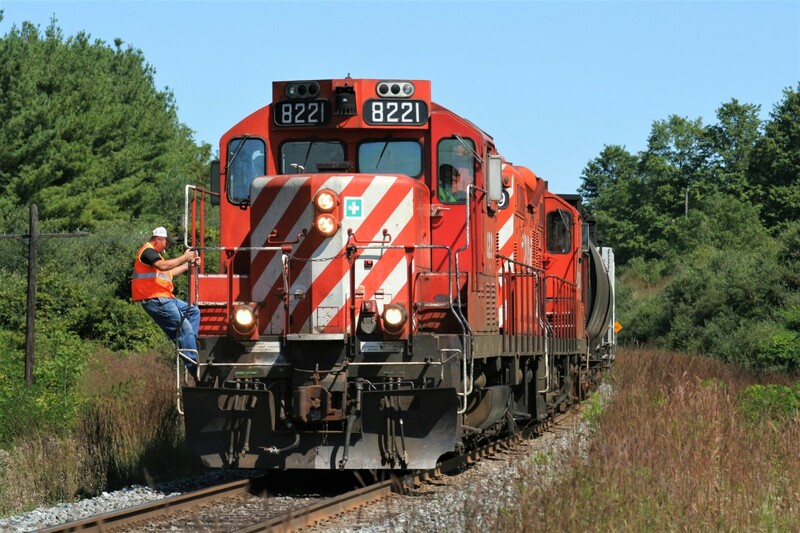 Railpictures.ca - Jason Noe Photo: The conductor of the Hamilton Turn with 8221 and a sister GP9u is preparing to enter the east switch of Killean siding, just east of Galt, for a meet with 9561 east. In the years that followed, this end of the siding was since severed in the HH era, in turn only allowing CP trains to meet east of Cambridge at Puslinch or west of Cambridge at Orrs Lake. | Railpictures.ca – Canadian Railway Photography – photographie ferroviaire Canadienne. Caption: The conductor of the Hamilton Turn with 8221 and a sister GP9u is preparing to enter the east switch of Killean siding, just east of Galt, for a meet with 9561 east. In the years that followed, this end of the siding was since severed in the HH era, in turn only allowing CP trains to meet east of Cambridge at Puslinch or west of Cambridge at Orrs Lake. I remember this! Pulling out the classics now haha.